With the Fourth Circuit Court of Appeals adding seven days to Early Voting, the NC State Board of Elections (SBOE) has opened the door for county BOEs to muck about, and the Guilford County BOE decided -- actually announced last week -- that it would be extending Early Voting only at the BOE's office downtown and that it would also be closing sites at UNCG and NC A&T and at Barber Park, a majority black polling place. That was the Republican plan until noon today when the Guilford BOE called its emergency meeting and watched the place swarm with protesters who "filled every seat and lined the walls" (reporting by Kate Elizabeth Queram in the Greensboro News&Record). Take a look at the video. 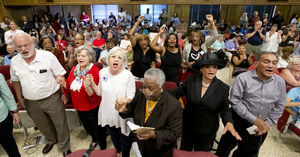 Board of Elections members were drowned out for most of the proceedings by the audience, who shouted for a public comment period and eventually linked arms and began singing, "We Shall Not Be Moved." Board of Elections Chairwoman Kathryn Lindley pleaded with the crowd to be quiet. Eventually, board members pushed their chairs back from their microphones and debated behind the dais as the crowd chanted, clapped and sang. Something big happened in that meeting behind the dais that nobody could hear. The Republicans caved. They approved more Early Voting hours than in 2012, kept the two college Early Voting sites and the black precinct site, and kept weekend hours. The head of the Watauga BOE is one of the most obnoxious public officials in a state filled with public officials. His disdain for the public was on full display that the recent BOE hearing. His plan was written in advance of public input and remain unchanged after public input. He threatened to kick out the loud people in the audience. His sidekick claimed she had nothing to do but follow along, but really, any good Christian should know better... and she should know better than to support voter suppression. NCGOP's voter suppression plans are totally unAmerican! This is what happens when you push an un-American agenda in a city with a long, legendary history of progressive activism. Greensboro isn't the backwoods hinterlands you are used to ruling, GOP! So proud of Greensboro. I am a Guilford College graduate and long time NC citizen. I love Greensboro and my state. The 99% won one small skirmish last night. The war is just heating up. Google Our Revolution and join up.